in Paris. The King ate with his fingers all of his life, but the fork was in fairly common use by 1648. King Louis actually ordered knives to have rounded edges to make eating with the knife less dangerous, and plus if one became angry during the meal, the rounded knife was less dangerous. He was the first monarch to offer place settings for each of his guests. A priest would say grace to begin the festivities, then bowls of scented water were passed in which the guests were to wash their hands, but not in the same bowl as the host or anyone one of higher status, unless specifically invited to do so. In the earlier part of Louis XIV's reign soup was served in a two-handled porringer, from which each guest drank in turn. Even when individual soup bowls came into existence, everyone dipped into the tureen with his own spoon. Each guest at this time also had his or her own drinking vessel, unlike years before when one or two drinking cups were passed among the guests. 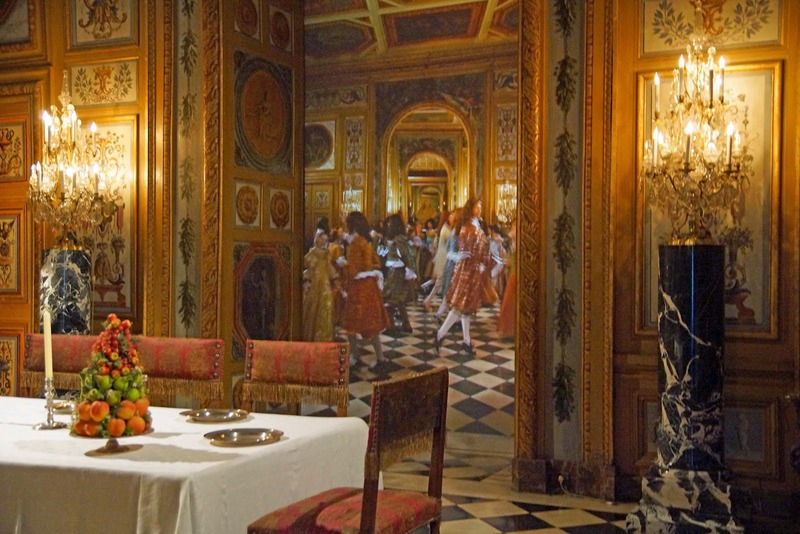 The individual drinking cup would be placed on the buffet behind the guest, and he had to order a servant to fetch it for him whenever he wished a drink. The guest had to maneuver through this by speaking softly or making a sign to a lackey. To do so in a loud voice was considered bad manners and vulgar. One was not to tear meat or bread, but cut it with a knife. No elbows on the table. One was not to eat so much as to develop hiccups, nor make noise while eating. Blowing on one's soup was considered bad manners and to lick the fingers was the height of impropriety. Napkins had come into vogue where heretofore the guests simply wiped their hands on the tablecloth. The rich ate mostly meat. Vegetables were not as plentiful. As a result constipation was an ongoing issue. The men were not to spit or urinate on the floor. Etiquette in the court of Louis XIV defined every phase of court life from the lifting of a gentleman's hat to a lady, to how one sat at a banquet table ... no crossed legs. The men might split their pants! People practice different modes of etiquette from culture to culture and from generation to generation. 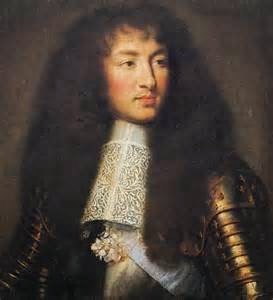 To enter a chance to win a copy of my book set in the court of Louis XIV, In The Shadow of the Sun King, leave a comment and answer this question: What common courtesy have you seen change from your generation to the younger one today? 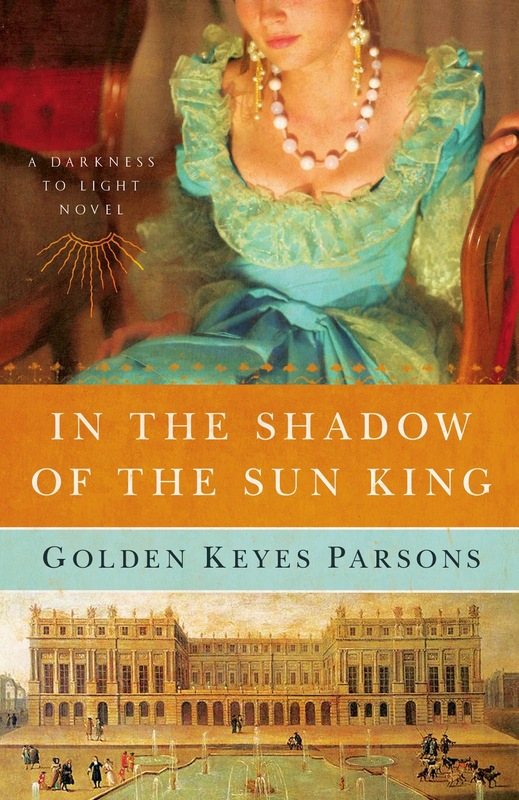 Golden Keyes Parsons writes historical fiction, and is also a popular retreat/conference speaker. Her highly acclaimed Darkness to Light Series (Thomas Nelson) chronicled the journey of her French Huguenot ancestors in 17th century France. Her fourth novel, His Steadfast Love, is a Civil War novel set in Texas. Her latest release is a compilation of four novellas (WhiteFire Publishing) – a biblical fiction series entitled Hidden Faces, Portraits of Nameless Women in the Gospels. Golden lives in Waco, TX, with her husband, Blaine, where they enjoy their children, grandchildren and are avid sports fans of their alma mater, Baylor University. You can contact her at www.goldenkeyesparsons.com. Growing up we would always wait for the host to begin eating before we started in on our meal. It was just a courtesy. No one seems to observe this little nicety any more. Men rarely pull the chair out for a woman when they go out to eat. Even waiters don't do that. Few men open the car door for a woman. (Women's lib has changed many of these customs.) In grammar school we practiced bowing and curtsying. Today it is a lost art in America. Even practicing a proper handshake has been replaced in some cases by knuckle bumps, high fives and hugs. Standing when a lady enters the room or approaches is another courtesy lost, but I don't remember the bowing and curtsying even in my generation ... and I'm probably one of the oldest authors in this group. :) My husband still stands for a lady -- bless him! 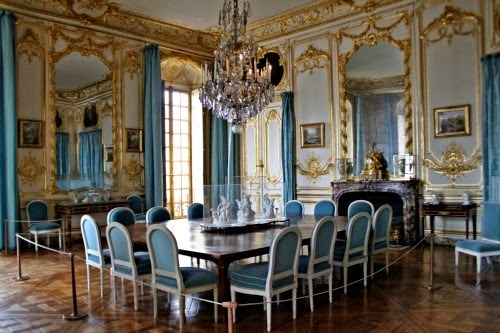 I thought it interesting that they had all this opulence but that some of them still ate with their fingers. I've been to a couple of restaurants where the waiters pull out the chair for the lady, place her napkin for her, and then if she excuses herself to go to the ladies room (powder room, perhaps?) they place her napkin just so on her chair. It was a very quiet, elegant dining experience for a party of 6. I very seldom hear please & thank you from younger people. I am usually surprised when any person holds the door for anyone else or says thank you when I do.. I wish they still taught manners in school, there is so little respect for teachers, older people or for anyone it seems.. I agree with the waiting to start eating until everyone has been seated or everyone has their dessert in front of them. We try to keep that one alive, but it's mostly a dead manner these days. I cannot imagine the drinking all from one cup! EWWW! Opening doors for a lady went by the wayside on my college campus back in the days of the women's movement. We were very capable of opening our own doors, thank you very much. I'm glad we didn't succeed in eradicating it completely, though. I appreciate having a door opened for me now and then. When the young men at church do that for me, I am very appreciative. Then again, I no longer feel that I have anything to prove in regards to "I am woman, hear me roar" LOL. I tried to have family meals where everyone ate at the same time and at a table. I have observed my grandchildren eat whenever an adult prepares them food and takes it off to a bedroom or TV room. Such a shame. Conversation at the dining table can be helpful in providing guidance or information. In some circles, it seems to be OK to eat with your hat on. Never would have happened at my parents' table!